Good news to Linux Desktop Users! Tex and Ripper Gang will offer PCLinuxOS 2007.1 soon followed by PCLinuxOS 2008. Now no more downloading of more than 400MB software after installing PCLinuxOS 2007. PCLinuxOS 2007.1 will sport 2.6.24 kernel and latest stable packages from the repository. This release will have more drivers for the latest notebooks and desktops. The name "2007.1" does not seem fitting in the year "2008," but it is good as an update to 2007 release, and there will be a totally new 2008 version with much makeover and features. It is due shortly, but don't ask when exactly. As they say it will be ready when it is ready. For more please read PCLinuxOS 2007.1 thread. Still on training wheels when it comes to Linux and PClinuxOS is the distro I decided to go with after using Kubuntu at first *and trying out others. I hope they make upgrading from 2007 to 2008 as simple as installing a dual boot was.but then the adding all those programs/files takes forever. This is a good step. I show people how easy it is to install PCLinuxOS (enter, enter, enter, enter...) and they are shocked. Let's hope this ease of use lies true for the upgrade as well. The screen shot does not show an install icon? 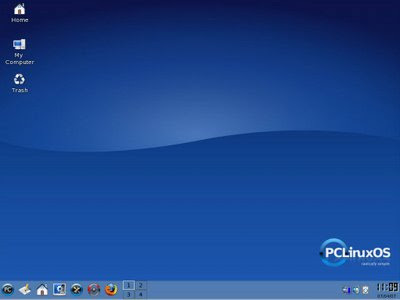 Definitely, that's not an install icon, that's the default pclinuxos 2007 desktop. 2007.1 will look also the same. However, 2008 will have a different, or may be an improved look and feel. Nice info, Thanks! I am eagarly waiting for next update from pclos, Eventhough i am uptodate with the updates. It is easier to install new version and update with less updates than install old version and update more updates. The longer I use PCLOS the better it gets. Two years ago, I was a 60 yr old computer illiterate and one year ago I acquired PCLOS. The more I learn, the more PCLOS works for me. If you know what you want, PCLOS 2007 can do it. It is so comprehensive, you have to learn how to configure. You can make it do anything if you just tell it. I had an IBM personal computer in 1982. DOS on a 5 1/4 floppy and lasted through the "386". Bill Gates ruined it for me after that and I dis-associated from the personal computer around 1988. I was afraid that the superior language writer minds were lost but, this "open source" and what it has achieved just blows me away. It's amazing what people can accomplish when individual, personal gain is not the ultimate objective. The Linux movement is real and OS'S like PCLinuxOS makes it easy with such a good GUI. Keep up the good work! who knows pclos 2007.1 may release in 2009. a distro is named 2007.1 and release in 2009, isn't it a big joke in this fast moving world? please stop posting anything about pclos, it's as uncertain now, as it has always been. Hi, please don't post such rants on the release schedule of pclinuxos. I personally like the rolling update model of it. what does matter when it's going to release? if you like it, use it, otherwise just stop talking about it. anyway, pclinuxos 2007.1 release won't stretch till 2009. i hope it will be ready very soon. I've been waiting and waiting. I have one computer that won't boot up after running updates, had to reinstall. And I have a laptop that will boot off the livecd but won't boot after install. I think the issues that affect the laptop might be what is causing the delay. I love the rolling update idea, but the drawback to it is that if you have a hardware or driver issue that prevents it from booting, you are left out in the cold unless you want to experiment with re-mastering. I can't do that, much as I would like to take it up as a hobby, because I have a job that keeps me very, very busy! I would never shoot in dark. Though it is true that the release of pclinuxos 2007.1 iso is getting late, but it's good good to get a rock stable release. And I believe that Tex is putting his best into it. For the time being you can use Sefy's PCLinuxOS Remaster, that's fully loaded and updated to meet everyone's need, or you can even try Granular 1.0 RC, it is also very good. To Anonymous, if your system is freezing up after an install. My guess is kernel panic due to a SATA drive, do you have a SATA drive? As the beta of PCLinuxOS 2009 is released, I think the community has dropped dropped pclos 2007.1. So the leap is from PCLinuxOS 2007 to 2009. However, it might take little long for PCLinuxOS 2009 to arrive.